Always first with the news, ready to give you the best advance tips hot off the press, I’d like to recommend you all hurry along to see a play which is completely sold out and finishes tomorrow. What can I tell you? I’d have mentioned it earlier but I didn’t see it til tonight. Jez Butterworth’s Jerusalem, at the Royal Court, is just an incredible thing, wondrous, spellbinding, straight into my top three best nights ever in the theatre. Bear in mind I’m not a massive theatre buff. I love the idea of theatre, I get excited about going, I want to be the kind of person who sees every new play, I find the whole principle of live theatrical performance stylish and beautiful and urgently to be treasured - and then I get in, the curtain goes up and I’m asleep within 20 minutes. Not in this case. I was totally gripped, mesmerized, awestruck for a full three hours, more completely awake than I am anywhere else except the poker table. I won’t tell you the plot - what’s the point? It’s finishing tomorrow. You can’t go. I’m sorry. I wish I’d gone before. If I had, I would have gone again. I’m posting this for two reasons: one is that I want to write a love letter to Jez Butterworth. This play is epic, magic, Shakespearian, full of tradition yet completely original; the language is so beautiful, the shape so perfect; and I’m so grateful to watch something which trusts its audience to do a bit of the work in their own heads. Most writers succumb to the temptation to spell everything out - bad writers do it because they want to spoon-feed the audience something easy, good writers do it because they’ve thought of something clever and can’t bear the risk that the audience might fail to notice it. This play is brave enough to leave references hanging and ideas suggested, it leaves you to think and imagine in your own space, it’s just so scriptible and the result is something properly challenging and ultimately fulfilling. who I think is going to do amazing things in his life. The whole cast is fantastic. Nobody could accuse Mackenzie Crook of being miles out of his comfort zone as the disgruntled scapegoat, but he does it with beautiful subtlety and perfect comic timing. Mark Rylance, in the main part as a drunk Romany stuntman, is just astonishing. He is intensely charismatic, stunning to watch, deeply affecting, funny, terrifying, tragic, in total physical control. But of course he is. He’s Mark Rylance. He’s like that in everything. He shines on the stage like fifteen halogen lights; in this particular role he’s like… he’s like a good Daniel Day Lewis. If you can imagine that. Imagine all Daniel Day Lewis’s dark intensity, determination, star quality, anger, energy, commitment, except not rubbish. And they’re all good, they’re all good. But this Tom Brooke, I want to keep an eye on him. I actually met him a year or so ago, when the director Raz Shaw asked me to go into the Royal Court to talk to some actors who were “workshopping” a play about gambling addiction. Tom Brooke was one of them and he was immediately noticeable; all the actors (and they were all super-promising young performers) did various pieces of semi-improvised stuff and I found that I kept watching Tom Brooke - he had that quality where you want to keep looking at him to see what he does next. I remembered him for a long time afterwards, and I’m a person who can barely remember my own mother’s name. I’d guess that in “theatrical circles” Tom Brooke is already very talked about. Maybe he’s already famous and just off my radar? God knows I don’t notice much. But I sort of forgot about him, until he danced onto the stage in this production and I remembered immediately. At the risk of sounding like a judge on the X Factor, he just “has it”. You know how, sometimes, you find yourself watching a play or a film and thinking “There’s nothing to this acting” ? You think, “Oh, anyone can do it, stand there and pretend to be someone”. And then occasionally you see someone who is a radical counter-argument. Like.. you know.. Dustin Hoffman. Tom Brooke is like that. Everything he does with his eyes, his hands, his body, his expressions, his speech, makes you think “I could never do this in a million years”. He’s completely in the zone, transformed into a character, and you don’t want to stop watching him. So, having irritatingly recommended a play it’s now impossible to see, I will tell you to look out for Tom Brooke. I’m going to try and see things that he is in. I think he’s going to be a star. Not necessarily in the Hollywood sense - he might not want that. But I’m excited to see his future performances, he is going to do brilliant things as an actor and I have decided I’m going to be A Fan. Am I being too gushy? It was a really inspiring evening. It made me want to write with that much energy and ambition myself. I’ve come away thinking that I want to write a stage play, and I’m going to start with the question: who would Tom Brooke be? That is a PROPER review. I’m sick and tired of morons doing exactly what you described, lazy writers who ruin a film or stage play by telling you exactly what happens from Act One, Scene One to The End. That’s not reviewing, it’s like copying someone else’s homework at school. You liked the play, transferred your enthusiasm to me and made me want to go to see it. That’s what a reviewer, who gets paid to do the job after all, should do. Or alternatively, if they don’t like what they are reviewing they should at least entertain the reader as they launch their barbs at the artists concerned. Thanks Andy - I’m only sorry I made you want to go and see it when it’s too late! But maybe it will be back on soon - I do hope so, and with the same cast. A friend of mine just told me he’s going to the last night tonight and I’m VERY JEALOUS. The thing about spelling it out - I actually meant writers who do it within the play or film itself, ie. who write a script that hands you all its messages on a plate, rather than subtly throwing out ideas and letting the audience fill in the gaps. But reviewers who retell a plot are even worse, ugh, it’s not just lazy, it can often spoil the viewing because you know too much and you’ve been told it through the filter of a reviewer’s opinion. I never read reviews until after I’ve watched something, just in case. I saw that a couple of weeks ago and thought it was absolutely wonderful. I will go again if it is on again but can’t imagine it without Mark Rylance. But I also thought Tom Brooke was great, I didn’t know his name (didn’t buy a programme as it contained the whole script and I couldn’t trust myself not to flick through to the end during the interval!) but he is a wonderful young actor & I’m glad to know his name as will also look out for him. It’s incredible to witness a truly mesmerising performance in the flesh. I only wish I could have got to see the play myself, but here in the North we don’t trust any form of performance art that doesn’t feature the crowd shouting “He’s behind you!” As a result it’s unlikely to hit my local radar anytime soon…. that said, at least we still have the Hollyoaks…. Why are you not a fan of Daniel Day Lewis? I’m afraid this revelation has dealt your “World’s Most Perfect Woman” ranking a severe blow. Its not really relevant to your blog post but I just wanted to say how delighted I am to have got my copy of Once More With Feeling in the post today. I’ve already giggled my way through the intro and looked at the pictures. I was particularly taken with the photo captioned ‘Charlie selects items from the buffet’ and it warmed my heart to see that someone on the catering staff had left out a large sausage roll for him. At least, I think that’s what it was. I’m so looking forward to the rest of it. Best wishes, Jules. What an excellent recommendation - something to look out for should it return. And someone to keep our eyes on. 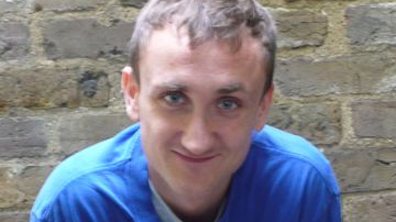 I recognised Tom Brooke from the photograph you have included. He had a part in last year’s Richard Curtis movie ‘The Boat the Rocked’ (Hey! No sniggers, it was a fun film - a person’s tastes can range from Royal Court performances to rom-com). He underplayed magnificently. This movie was laden with 60’s hits, but not one Beatle’s track was included - go figure…. I guess there are copyright/ cost issues, I don’t know. Though if that was the case, how come Heartbeat (the eternally comforting itv series) manages to adorn its sountracks with the fab Four - okay, okay, now you can spurn my viewing choices. I forgot to answer the question about Daniel Day Lewis. Oh, look, I’m sure he’s a great actor in lots of things. I got angry with him after There Will Be Blood - or, as my friend Claudia calls it, There Will Be Ham. I hated that film very deeply but it wasn’t entirely his fault; the script was weak, the plot preposterous and the violence indefensible. And you can’t - as actor, writer or director - ask me to swallow a story that takes itself quite so seriously, when it culminates in the sight of a vicar being battered to death with a skittle. Nevertheless, if there was any opportunity to calm that nonsense down with a measured, subtle performance, DDL opted not to take it. Thankyou for such an impassioned answer regarding Daniel Day Lewis; I actually find myself growing less fond of his scene chewing after reading your words! Seriously though, There Will Be Blood is really hard work as a film; with such horrible characters at its black little heart, a film like this can easily alienate an audience. In its (admittedly limited) defence, the director (Paul Thomas Anderson) says he made it as a horror film, and whilst I admit that changing the genre of a film doesn’t make it any more appealing, perhaps it puts some of the film’s more harsh elements in a different light…Then again perhaps not. That’s enough; the pun police are kicking my door in. found this blog looking for Tom Brooke. Saw J for second time last Saturday. Still exceptional, only minor disappointment was recasting of Lee. Unlike other recastings this was much inferior. In hindsight, and thanks to your blog, maybe Tom has just set the bar too high. Saw Tom Brooke as Edgar in National Theatre’s production of King Lear. An astonishingly moving performance from an extremely talented actor. I saw his father at Stratford many years ago and he too’ is a fine actor.